Visigoths in Spain. Sisebut, AD 612 to 621. Gold tremisis. Denomination : AU tremisis. Mint : Seville. Date : Sisebut ruled from AD 612 to 621. Reference : MEC volume 1, #232. Size : 18.7 x 19.2 mm. Weight : 1.40 grams. Grade : XF with a very minor flan crack (these are normally found in this grade). Obverse : Bust forward, with + SISEBVTVS RE around. Reverse : Bust forward with + ISPALIPIVS around. 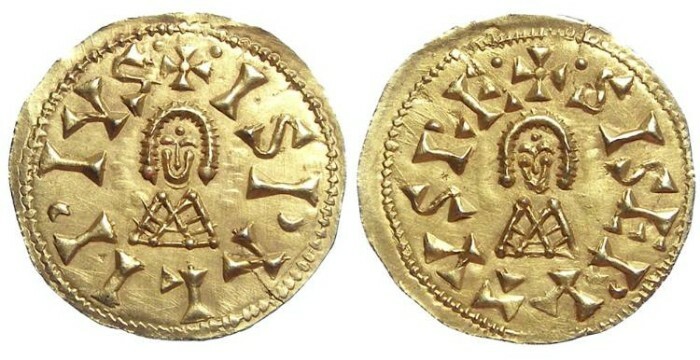 This is the commonest Visigothic gold type.